← Formal and Informal writing. The final presidential debate before the Election Day, November 6. Greenpeace is a huge environmental organization. The organization was originally founded in Canada in 1971. Today Greenpeace has offices in more than 40 countries around the globe. Greenpeace’s main focuses are making people aware of global warming and finding ways to stop it and stopping deforestation, over fishing and such. The organization does not accept any goverment founding and are completely relying on their 2,8 million individual supporters. Another big focus area for Greenpeace is wahling. Today I’ve seen the film “Big Miracle”. The film is about three wahles stuck in the ice outside Alaska and the rest of America trying to help. The rescue mission was started by a Greenpeace activist. She meant that drilling for Oil in Alaska was wrong and when she got to know about the wahles she did all she could to save them. I think the opperation was a nice, but a bit silly thing to do.. I believe that spending such amount of money on three whales while people in the world are starving is wrong! It is important to help animals in need, but there are limits. In the film they tried to drag an ice-clearer several hundred miles with helicopters, when it failed they called the russians and asked them for help. 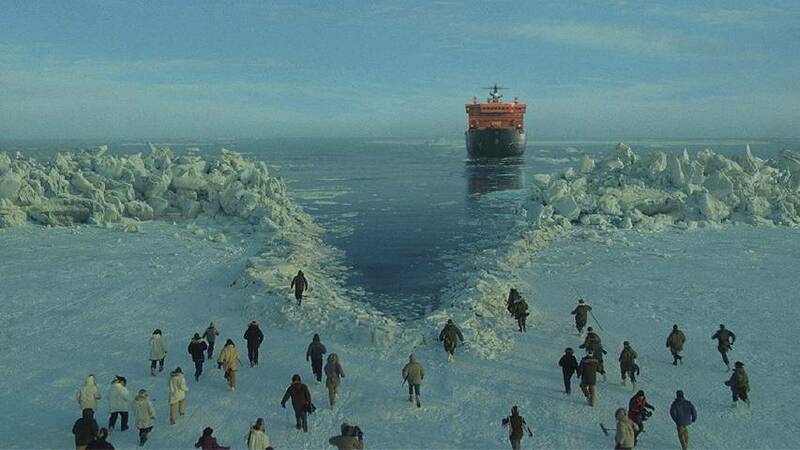 The russians came with a huge icebreaker boat and crushed the ice. In doing so they even ruined their boat. I liked the film and i think it is important to help the animals, but it shouldn’t be our first priority. And in the end, only two of the three wahles survived. The originale people in Alaska are called Inuit. In Alaska there are about 24.000 Inuit. The Inuit in Alaska are the Inupiat, most of them are living in Northwest Arctic Borough, the North Slope Borough and the Bering Straits region. Barrow, the most northern city of the USA is in the Inupiat region. Yes it was a costly operation to save 2 whales. Think about how the money might have been spent on something more else? Still Greenpeace do a great job. You could perhaps write about the people who live in Alaska as well. I find what you’ve said about Greenpeace to be very informative. Honestly, I didn’t know that much about them. But it should be known that most of that movie, “Big Miracle” was over-exaggerated by Hollywood and Drew Barrymore. The 1988 whale rescue was very important. And not only was our nation involved, but so was Iceland, Japan, and Russia. I can understand you being upset about millions of dollars going towards saving three whales when only two made it, and under normal circumstances, I’d be upset as well. But grey whales are an endangered species. We need to do everything we can to preserve what is left of the species. I can see that you have a problem with placing animals at a higher priority. If you were to take action on that, what would you do? I think I would try to save the whales, but at a lower cost. And maybe do it without calling in Japan, Russia and Iceland? But anyway, thank you for your respons!